Prepare to be astounded by the magic of the National Park during the nights of the full moon - a unique way to enjoy hiking through the volcanic landscapes of Teide underneath the entrancing light of the full moon and one of the world’s best and overwhelming starry skies. Never has a night walking tour given so much! And on top of that, you get to do a low difficulty walking tour through the Alto de Guamaso as well. This experience also gives you the added bonus of stargazing by the naked eye with Starlight guides. Nature in the pure state of the night. 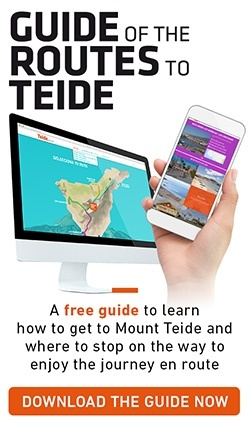 If you decide to discover Teide on this Teide night walking tour, you will be in good company with our official guides. So that you don’t miss a moment of this Teide night exploration nor its landscape views from the Alto de Guamaso trail, an experienced guide will accompany you and explain all there is to know about one of the world’s most fascinating volcanoes. No wonder why the Guanches used to call it Echeyde, the home of Guayota, the Malignant. The tour starts at El Portillo and all you need is water, comfortable and closed footwear, long trousers, sun protection and a suitable jacket to put on to enjoy the spectacle of the stars. Leave the rest to us! Your guide will take you north, so that from the trail, in the immensity of nature, you can enjoy the sunset with views of the summit of Teide volcano. From there, you will head down to a Tagoro, a circular enclosure made with stones in which the ancient Guanches made fundamental decisions about the community and from which you will be able to observe the star-filled sky with the naked eye whilst your Starlight guide will uncover the secrets behind each star. If you like exploring nature and the stars keep pulling you in, here you have the opportunity to find out what is hidden behind the Teide landscapes and it’s sky. Once the astronomical observation finishes, you will head back to the starting point. We will meet in the car park of the El Portillo restaurant, 30 minutes before sunset. The exact time will be announced the day before the activity. IMPORTANT: You should be prepared for extremes in weather, both heat as well as cold, depending on the time of year. We do not admit under 13-year-olds, people with physical disabilities, reduced mobility, injuries or cardiovascular problems on this Teide night walking tour. It is necessary to produce the booking confirmation, either printed or displayed on a mobile device. It is very important that you wear suitable footwear and warm clothing. In the event that weather conditions impede or hinder proper visibility of the stars on the day of your Teide night walking tour with astronomical observation, you will be provided an alternative explanation by the guides. If the trail is closed, we will offer you an alternative date and/or a refund of the amount paid. Yes, at the Visitors’ Centre in El Portillo. There are no special rates or discounts available.